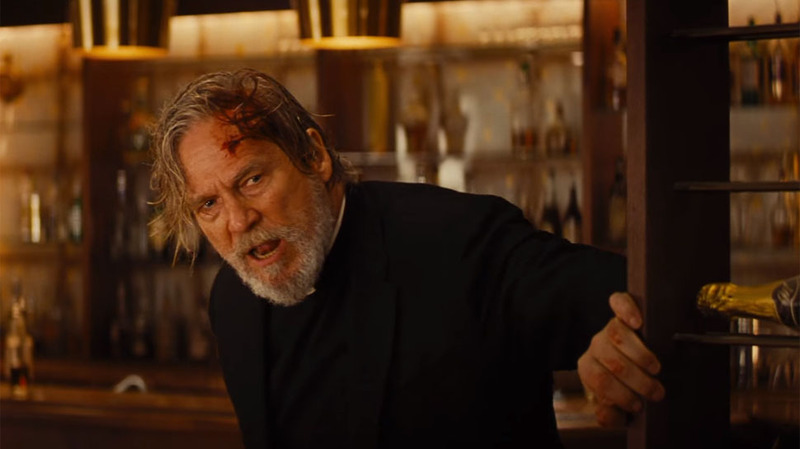 Anyone could be forgiven for eyeing the 2 hour and 21 minute running time of “Bad Times at the El Royale” and being concerned that the film, a noir set almost entirely in a kitschy hotel one dark and stormy night in the late sixties, is going to be overlong and indulgent. Nor would that person be altogether wrong, because it seems like unless you’re making “Once Upon a Time in America”, two hours is probably more than enough to tell your crime story. But “Bad Times at the El Royale” is the latest from director Drew Goddard, whose “Cabin in the Woods” (admittedly much leaner at an hour and thirty-five minutes long) might provide a little bit of context for what he’s doing with this film. “Cabin” was ostensibly a horror film, blended with a workplace comedy, and steeped in the tradition of 80’s monster movies, a mixture of genres that would usually sound better on paper than on film, but which turned out to be pretty delightful, at least to those with a taste for horror. Goddard does something similar here, but with the more limited scope of the mid-century crime story. So like “Cabin”, “Bad Times” brims over with tropes, from the kindly priest who is more than he seems, to the showgirl desperate for her big break, from the haunted junkie to the charismatic cult leader. 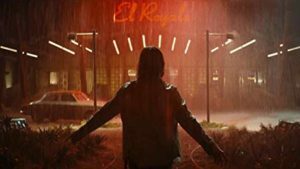 These characters and more seek shelter at the El Royale, a tacky casino hotel that straddles the state lines of Nevada and California, with gambling legal on the Nevada side and all the booze on the other. As is so often the case, no one is what they seem, nor is the El Royale itself, whose mysterious management seem to have supplemented their income with some shady, if ambitious side projects. Then there’s the missing sum of money, the take from a decade old score, not to mention the fact that one of our party is a secret G-man. Unlike “Cabin in the Woods”, which had so much fun mashing together disparate genres, “Bad Times at the El Royale” has almost as much fun mashing together crime and noir subgenres into something which, if not utterly original, is still a hell of a lot of fun. And it turns out that there are enough excellent performances (especially from Jeff Bridges) and nifty twists to almost entirely justify its baroque length — which is to say, I was almost sad when it was done, and how often can you say that about a two and a half hour long movie?